Mrs. Campbell was blessed with five daughters. She loved each one of them and they loved each other. Mrs. Campbell couldn't believe how different each of them was. Fiona had long blond hair and loved to go shopping. 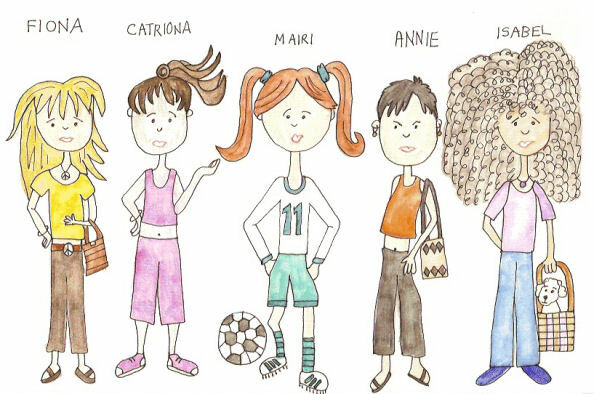 Catriona had long brown hair that she always wore in a pony tail. She loved to go running and to the gym. Mairi was a soccer fan. She had long red hair and wore her uniform a lot. Annie was the fashion model. Her hair was short and dark. Isabel had the most hair of them all. It was frizzy and curly and poofed out all over her head. Isabel loved pets. She had a dog named Twinkles that she took everywhere with her. Mrs. Campbell wanted to have a party for her daughters. She wasn't sure what sort of a party to have since all the girls had such different tastes. "Should I have a pet party, or a soccer party, or a shopping party, or a running party or a fashion party. Oh my! I'm not sure what to do." She fretted about it all day long. "Maybe I will just have a party that I like and hope they'll have fun." Mrs. Campbell went to the shops. She bought Hawaiian leis, and pineapples and all sorts of tropical fruits and decorations. She picked up some hula skirts and toy surfboards. She decorated the house all up and then called her daughters and asked them to come to a party. An hour later they showed up. Mrs. Campbell was afraid they wouldn't like the Hawaiian style. "Mama! I love this," Fiona said. "You must have had such fun buying all this stuff. I wish you'd called me and asked me to come with you. I love shopping." "Mama! This is wonderful," Catriona said. She put a lei around her neck and slipped on a hula skirt. "I can dance the hula." She nibbled on some pineapple and mango. Mairi showed up next. "Oh Mama. This is amazing. I love this Hawaiian stuff!" Mairi went into the bedroom and took off her soccer clothes and put on her swim suit and a hula skirt. She and Catriona had fun dancing. Annie came next. She stood at the door and looked at the decorations. "Mama! You've gone to so much work. I love it." Annie put a muu-muu on. "Isn't this beautiful? When I saw it I knew that I had to have it." Mrs. Campbell thought the pink and yellow flowered print was lovely. Isabel showed up next. She brought her dog, Twinkles, carrying it in a basket. "Oh look, Twinkles. Mama's decorated the house in Hawaiian style. Isn't it adorable." They spent the rest of the day together dancing the hula and talking about suntanning and surfing. Mama was so relieved. She thought they wouldn't enjoy themselves, but they did. Even though people are different, there's always something that can bring them together.